1.1 Hydraulic control system built with the electromagnetic directional valve. 1.2 Hydraulic control system built with the proportional solenoid valve. 1.3 Hydraulic control system constructed by the electro-hydraulic servo valve. 1. Open loop hydraulic control. The hydraulic control system is the control system which is composed of the hydraulic control and the transducer. Hydraulic control and energy exchange components usually refer to hydraulic control valves, hydraulic pumps etc. Hydraulic control technology is an important branch of automatic control technology. The hydraulic control system has distinct features, obvious advantages and plays an irreplaceable role. Hydraulic control technology is a typical integration technology of electromechanical fluid. For example, the electrical hydraulic control system based on the dynamic system, the negative feedback system is designed as a means. It is one dynamic system which integrated with the mechanical system, electrical system and hydraulic system. At present, hydraulic control technology has been applied in equipment manufacturing, automobile industry, aerospace, weapon industry, metallurgical industry, ship industry, medical engineering and so on. Like the electromechanical control system, the hydraulic control system can be divided into open-loop hydraulic control and closed-loop hydraulic control. We will take control of the machine tool movement beam as an example to discuss the open loop control system and closed loop control system. The machine tool movement beam is a common control object. Machine tool movement beam is the workbench body of the machine tool, it is installed on the slide guide of the machine tool’s body. Different types of machine tools have different performance requirements for moving beam. For example, the motion beam (workbench) of a surface grinder requires only a steady horizontal reciprocating motion, without the need for precise control of its displacement. The motion beam of the NC machining center or the CNC milling machine is used for precision feed motion, and the movement displacement of the beam needs to be precisely controlled, otherwise, the machining quality of the workpiece will be affected. However, for the control of the motion beam of the electro-hydraulic press brake, the distance of ram movement is also required high accuracy, otherwise, the bending angle is inconsistent and the bending effect is greatly reduced. In order to facilitate to explore the true difference between hydraulic open-loop control and closed-loop control, we will take the machine tool motion beam as a controlled object, respectively using electromagnetic directional valve, electromagnetic proportional direction valve and electro-hydraulic servo valve as the main control components, to build three common hydraulic control system of machine tool movement beam. The horizontal reciprocating worktable of ordinary surface grinding machine can adopt hydraulic control scheme as shown in figure 1.1. It uses the electromagnetic directional valve to build the hydraulic control system. Take the three-position four-way electromagnetic directional valve as the control unit, use the travel switch or proximity switch as the instruction unit and the electric relay constitutes a logical computing network. The control signal logic operation and power amplification can be realized, thus generating enough electromagnet to control the electromagnet of the electromagnetic directional valve. The valve core of the electromagnetic directional valve has three working positions, left, middle and right. It can control the oil circuit breaker and switch. For each valve port, there are only two states, which are fully open and closed completely. So the electromagnetic directional valve is classified in the electromagnetic hydraulic switch valve. The electromagnetic directional valve can only open and shut off the oil circuit operation to realize the movement beam start and stop. It is impossible to adjust the opening of the electromagnetic directional valve so as to control the speed of the moving beam. In order to adjust the movement speed of the moving beam, a throttle valve is installed in the hydraulic control system to realize the throttle control. Through regulating valve mouth opening, adjust the throttle pressure difference will adjust the oil flow back to the tank which through the overflow valve indirectly so as to change the flow of hydraulic oil inflow and outflow the hydraulic cylinder, therefore to adjust the speed of beam. The speed of movement beam can only be controlled by the throttle valve and cannot be controlled by electric control. The beam starts to stop, the speed changes suddenly, the beam vibrates greatly. The principle of the hydraulic control system of adopting the electromagnetic directional valve is shown in figure 1.2. The control signal is issued by the travel switch. The signal is the logic control unit (0 or 1). The control signal of each electromagnet of the electromagnetic directional valve is generated by the logic operation of the relay network and control the power supply of the corresponding electromagnet, the corresponding valve core movement. Therefore, realize the three position changes of valve core in the left, middle and right, output hydraulic control flow, drive hydraulic cylinder, and push the machine tool movement beam. In the hydraulic control system composed of the electromagnetic directional valve, relays can only issue simple control instructions. The control signal is one-way flow and only flow to the forward signal channel of the controlled object. This control system is an open loop control system. The timing of the response of the control instruction to the controlled object depends on the response time of each component of the signal transmission path. Because the control instruction signal is simple, there is no control system output tracking instruction signal problem. If a certain unit is disturbed and produces a false move, the system cannot be automatically corrected and compensated. The proportional electromagnetic directional valve is a new type of electromagnetic hydraulic valve with better performance and higher price. For the movement beam control which has the higher requirement for performance, such as numerical control surface grinding machine (No precise control of worktable displacement is required. ), the proportional solenoid valve can be used as the control unit to form a hydraulic control system with low impact and low vibration as shown in fig. 1.3. Fig.1.3 Diagram for adopting proportional electromagnetic directional valve to control system. The proportional hydraulic valve adopts the electric signal control valve core for gradual movement. Therefore, to control valve opening gradient change, adjust the pressure drop and flow rate of the proportional hydraulic valve. And to some extent, the ratio between flow and control signals is changed. The program controller generates electrical signals that control the moving beam and can control and adjust the movement speed of the beam with the gradual change of electric signal, thus changing the speed and direction of the beam in the movement. The movement beam starts to stop, the direction change is smooth, almost has no obvious impact. The principle of the hydraulic control system of the proportional electromagnetic directional valve is shown in figure 1.4. The control signal is issued by the program controller. 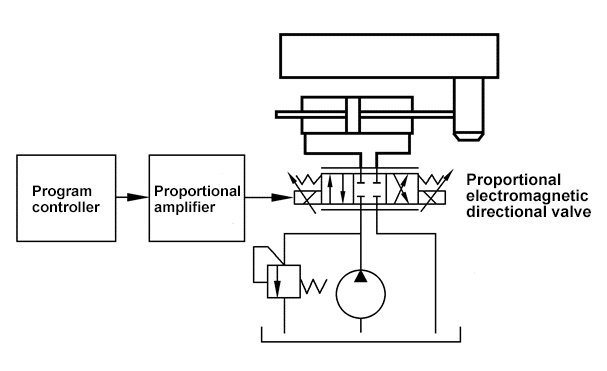 The signal is analog control (continuous electrical signal) which is amplified by a proportional amplifier to control the corresponding ratio electromagnet of the proportional solenoid valve. Therefore, push the valve core to produce the continuously adjustable displacement and generate continuous changed hydraulic pressure to control oil flow to drive oil cylinder. Then the beam movement of machine tools will be realized. In the hydraulic control system which constructed by the proportional electromagnetic directional valve, although it is possible to use a degree controller to issue a gradient continuous control command signal, the control signal is one-way flow and only flow to the forward signal channel of the controlled object. The command system can send a continuous gradient signal, and the system output can track the command signal. But the tracking accuracy is low, the response speed is slow, and the response speed depends on the response time of the transmitting signal element. The error caused by interference cannot be compensated automatically. Fig.1.4 Diagram for adopting proportional electromagnetic directional valve to control system. The worktable movement of NC machining center is the feed motion of the machining process, which needs high precision and response speed. The electro-hydraulic servo control system can be used. It adopts electro-hydraulic servo valve as the control unit. The electro-hydraulic servo valve is a high-performance hydraulic control unit with high control precision and quick response speed. The shortage is the high price of electro-hydraulic servo valves. The electro-hydraulic servo valve is often used in the electrohydraulic closed-loop control system. In the process of the closed-loop control system, the controlled object can be driven by the open-loop control mode temporarily. The hydraulic control system of the machine tools movement beam set up by the electro-hydraulic servo valve is shown in figure 1.5. The machine tool is equipped with a displacement sensor, which is used to detect the position of the moving beam, send out the position voltage signal, and then input into the electronic control device after amplification. 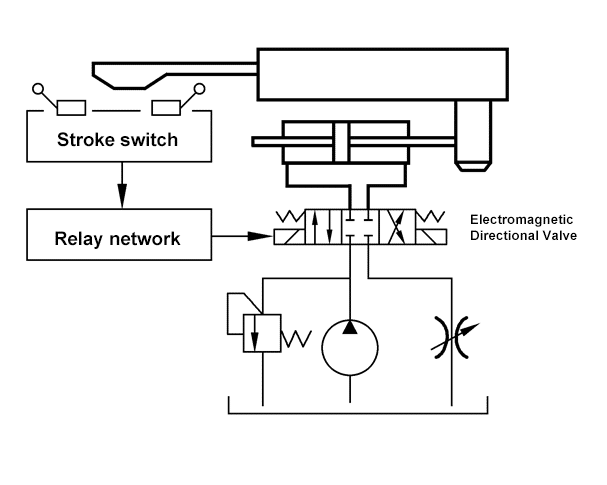 Fig.1.5 Diagram for adopting electro-hydraulic servo valve to control system. The control device compares the position voltage signal of the current machine tool beam with the control instruction voltage signal to generate the deviation voltage signal. 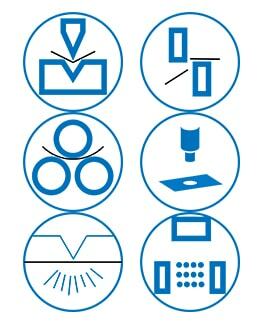 The deviation signal is the continuous analog voltage, which can accurately and real-time reflect the difference between the position of the machine tool beam and the control instruction (the position that the beam should be in). The deviation signal is amplified by the proportional amplifier, and the displacement of the torque motor of the electro-hydraulic servo valve and the high precision and high dynamic control valve core is controlled. Therefore, to generate the required hydraulic flow and pressure to drive the hydraulic cylinder movement, and push the beam movement of the machine tool. The beam motion is detected by the displacement sensor and is sent to the electronic control device. Thus, the closed loop of the control signal is formed. The control system is also known as closed-loop control. The above-described control process can be shown in the following figure 1.6. The system is a closed loop control structure. In the closed-loop hydraulic control system, there is not only the forward control effect of the controller on the controlled object but also the feedback effect of the controlled object on the controller. The closed-loop control system has the characteristics of high control precision, fast dynamic response and automatic compensation for external interference. Fig.1.6 Diagram for adopting electro-hydraulic servo valve to control system. Open loop hydraulic control and closed-loop hydraulic control are two kinds of basic control methods of hydraulic control. The open-loop control system which adopts the common hydraulic valve and the proportional hydraulic valve has great technical overlap with the hydraulic transmission system, and they almost use the same type of hydraulic components and hydraulic circuits. The performance of the open loop hydraulic control system is mainly realized by the performance of hydraulic components. The accuracy of the open-loop system depends on the accuracy of each component, and the response of the system is directly related to the response of each component. The hydraulic open loop control system cannot restrain or compensate the system output change caused by external disturbance and internal parameter variation. In terms of system design, the open loop hydraulic control system structure is simple and must be stable, so the system analysis, system design and system installation are relatively easy. It can also learn from the analysis and design experience of the hydraulic transmission system. Open loop hydraulic control system and hydraulic transmission system have many things in common, the difference mainly lies in their emphasis. The open-loop hydraulic system is often used under the conditions which require low accuracy control, small external environment disturbs, small changes in the inner parameters, slow responding time of the system is allowable. To sum up, the open-loop hydraulic control system is a kind of simple non-feedback control method. Only the controller can control the single direction of the controlled object, and there is no inverse effect of the controlled object on the controller, and the error caused by the interference cannot be compensated automatically. In view of the low accuracy and slow response of open loop control system, generally do not adopt servo valve which has the higher requirement for work conditions, high price, high performance to build an open loop control system. The closed-loop hydraulic control system often uses electro-hydraulic servo valve or a direct drive valve (DDV) as the control unit. Electro-hydraulic servo valve and direct drive valve are high-performance hydraulic control components. They contain a closed-loop feedback control system, so these two kinds of valves have high control precision and quick response speed. Usually, the closed-loop hydraulic control system is also called a hydraulic feedback control system, which works according to the principle of feedback. The basic idea of feedback control is to eliminate or suppress deviations with deviation. The feedback control system works by using deviation. By comparing the information of the controlled object detected by the feedback unit with the control instruction of the system instruction unit, the deviation signal is formed. This deviation signal is amplified by energy, which can drive the high power hydraulic control valve, control the hydraulic actuator, then drive and control the controlled object. The closed-loop hydraulic control system structure forms a closed loop. The closed-loop control system has a stability problem, the control precision and the dynamic response speed need careful design and commissioning, so the closed-loop system analysis, system design and system commissioning are more complicated. However, for closed-loop control (feedback control method), it is possible to build a control system with high control accuracy and strong anti-interference ability though adopting the hydraulic components with relatively low precision and relatively weak anti-interference ability. Or it is possible to obtain better control system performance and control effect by using closed-loop control under the condition of using existing hydraulic components. 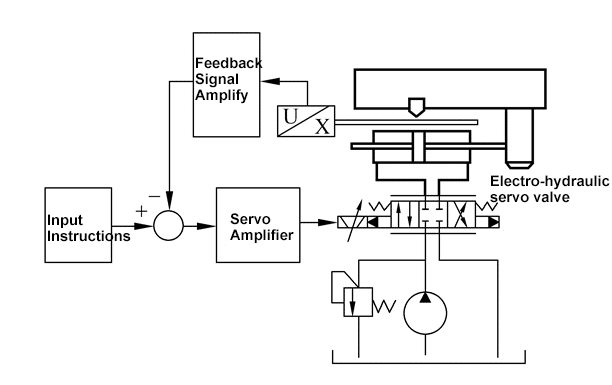 Feedback control has the advantages which can not be realized by open loop control.